In 1988 Acid House exploded across the world. The flowering that had begun in Chicago, Ibiza and London blossomed into the ‘Second Summer of Love’. For Chapter, steeped in rave culture from its inception, the thirtieth anniversary is a time to celebrate. He’s created the latest addition to his Smiley series is a tribute to that magical time when people smiled as they danced as if nobody was watching them. Smiley 30 is filled with the visual imagery of the period — the flyers that advertised club nights, the sensationalised tabloid headlines and, if you look carefully, one or two unexpected gems of his own. ‘When I think back to to those early days of acid house and rave culture, nobody expected it to last,’ says Chapter. ‘It was all pretty here today, gone tomorrow. The dodgy mix-tapes would unravel in the car stereo, newspapers would end up wrapping fish ‘n’ chips, and the flyers would go in the bin. ‘A lot of that stuff has been lost for ever which is a real shame. Some of the flyers and posters created for club nights and raves were genuine works of art,’ he says. ‘It’s easy to forget now how important they were to dance music culture. Back then there was no Facebook, Instagram or Snapchat, so they were really the only way we could find out what was happening. Chapter has long been fascinated by the evocative simplicity of the Smiley logo. It’s essentially just a circle, two dots and a curve. Now, its immediate association is with rave culture, but the motif has been around an awful lot longer than that, at least 3,800 years. In 2017 archaeologists from the University of Bologna working in Turkey put together a pot believed to date back to 1700 BC. It appeared to have a large smiley face painted on it. The multinational ‘Smiley Company’ on its website goes even further back and says the motif can be seen in French cave paintings going back to 2500 BC. Perhaps the Flintstones were early ravers. Even the Smiley graphic we know and love today long predates acid house. It is generally reckoned to have been invented in 1963 by American graphic artist Harvey Ball who was paid $45 for the logo by a somewhat unlikely contributor to rave culture, the State Mutual Life Assurance Company of Worcester, Massachusetts in the USA. The Smiley motif’s musical associations also predate acid house by a good few years. Flags, posters and banners with the logo were frequently seen at free festivals and psychedelic events dating back to the 1970s. And in 1982 the Smiley emoticon 🙂 began to appear in online discussions. That’s long before the existence of the internet we know today. ‘I still love the Smiley emblem because it’s so universal. And it does what it says. It makes you smile. And we all need to do that, don’t we,’ says Chapter, smiling, of course. 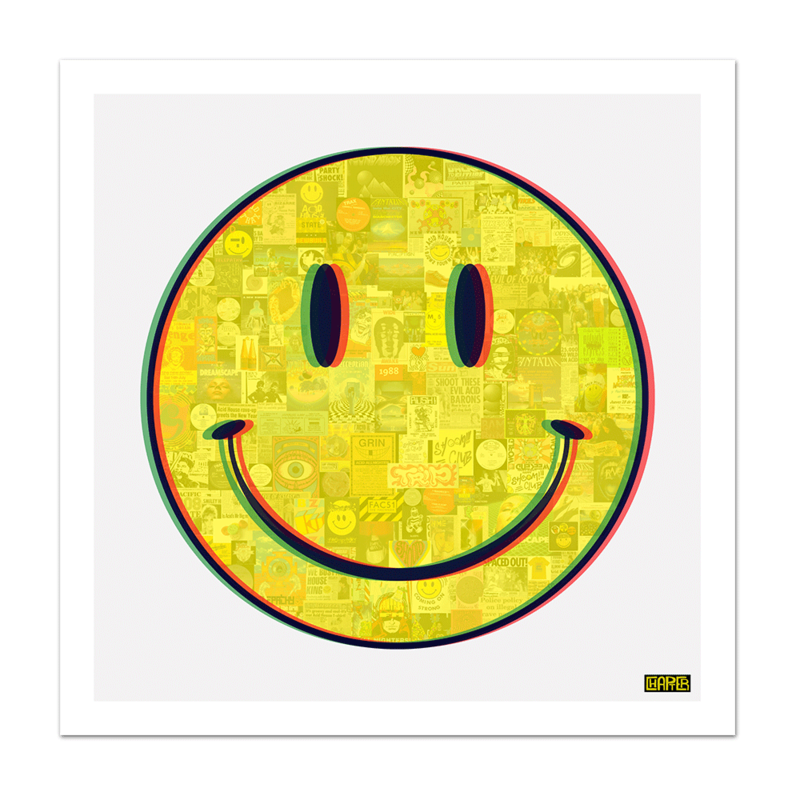 Smiley 30, available in two sizes 55cm x 55cm and 90cm x 90cm in limited editions of just 40, numbered and signed prints.